Indian Cuisine Tutorials: Punjabi Cuisine - Chicken Tikka - Simply Fahad-istic! This is Post No. 9 in Indian Cuisine Tutorials series.A new one each day! 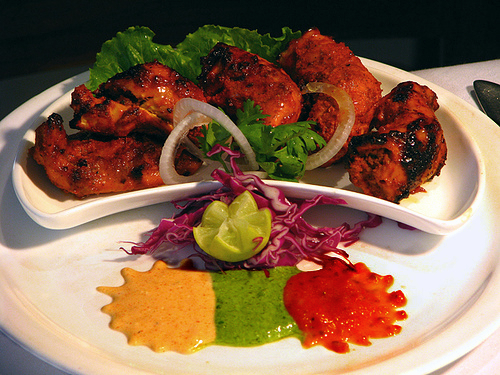 Another preparation very similar to tandoori chicken is Chicken Tikka.The prime difference between the two being,tandoori chicken is made with meat on the bone,whereas Chicken Tikka is made with boneless meat. 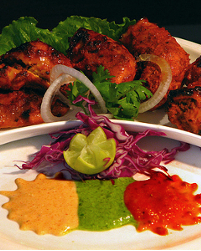 Neatly cut pieces of boneless chicken are marinated with yogurt,ginger paste,garlic paste,lemon juice,garam masala,red chili paste/powder and salt.After several hours of marination,this chicken is skewered and roasted in a hot tandoor till tender and charred.It is served hot with onion rings,lemon and chaat masala.